A falta de pan, tortillas In the absence of bread, tortillas will do In times of necessity, make do with whatever is available. We don’t really celebrate Cinco de Mayo, but it was a good time to use up several peppers and onions for a quick dinner. Original thought was to grill the chicken, but the weather didn’t cooperate and to use the cast-iron pan was plan B. 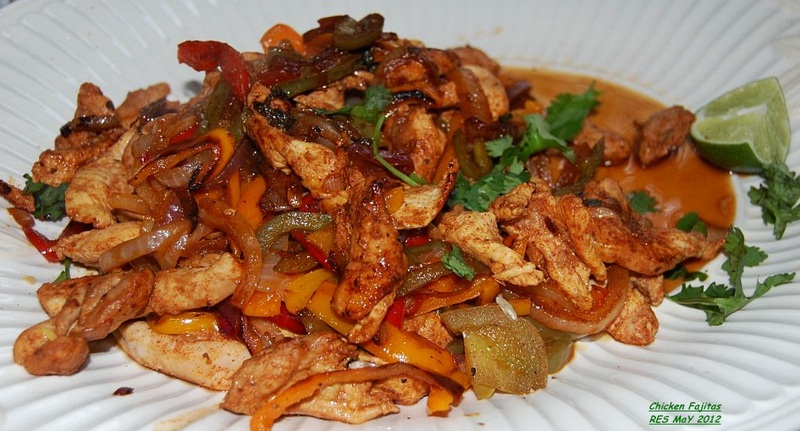 For two of us and enough left for one lunch I thinly sliced ½ large boneless, skinless chicken breast and 3 boneless, skinless chicken thighs, seasoned with my own toasted spice fajita seasoning, a little tequila and cilantro, marinate 20 – 30 minutes. One each large green, red, orange, and yellow peppers, 1 sweet onion and ½ red onion, tossed with some seasoning. Hot cast iron pan to which I added a tablespoon of EVOO. Sauté the meat and vegetables separately then toss all together in the hot pan to get sizzling hot before serving. The vegetables took about 7 minutes or so on medium high heat as did the chicken. I did this separately because the vegetables were oozing too much liquid and I didn’t want to steam the chicken, but if you have a T&T method or technique feel free to sauté your way. Alternately you can grill the whole seasoned chicken pieces on the grill and use a grill basket or screen for vegetables. Grill flour tortillas the last few minutes of cooking and wrap in foil to keep warm. Grilling is my favorite method by far.